If you are in need of screened in porch plans from which to build your porch (either DIY or to give to a contractor) then please read on. 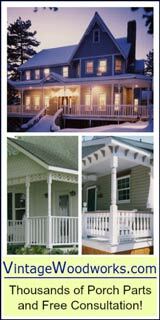 Screen porches, and even three season porches, are fairly easy to construct given the right plan and building experience. Most plans can be modified to fit your specific wishes or adjusted to fit your home's architecture. 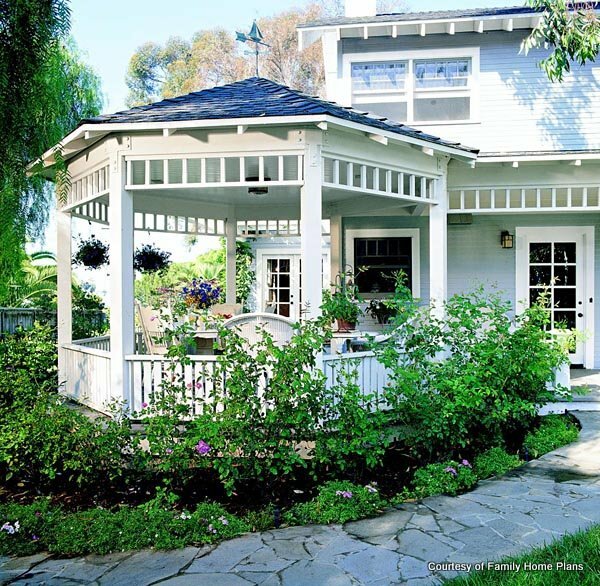 We are delighted at how many of our readers have found these porch plans. We are an affiliate of Family Home Plans. I prefer working from a plan and usually modify it to my own specifications. 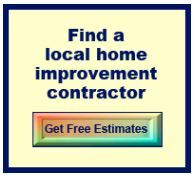 A good contractor could do the same for you. More often than not, you will need to make some type of modification as no two homes are exactly the same. See our selected plans below to find one that would work well on your home. 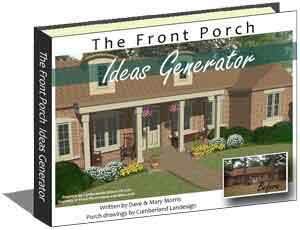 Although this is a porch plan, you could easily turn it into a screened porch. 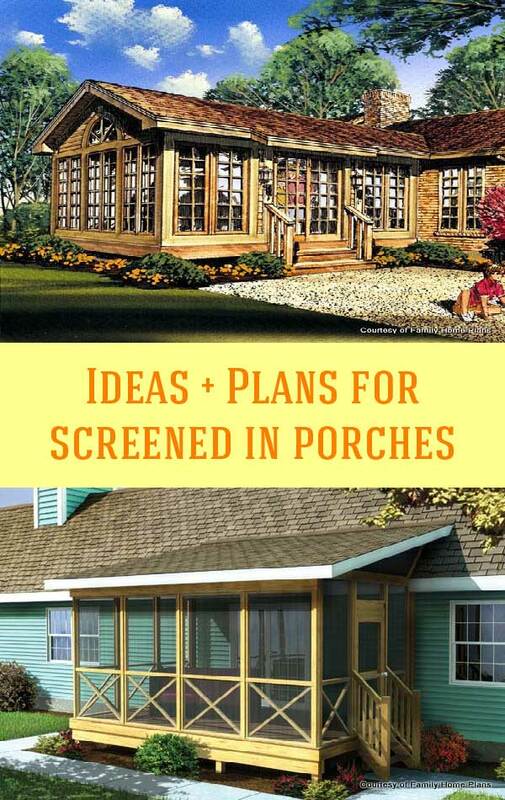 Peruse our screen porch building options. 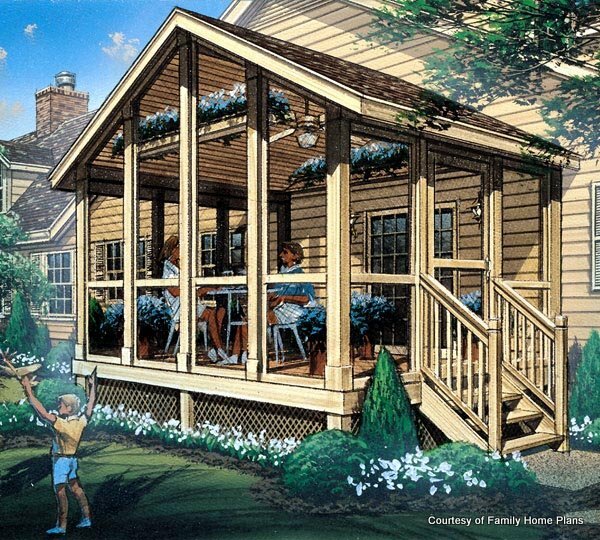 This is a typical screen porch plan for a two-story home. You could easily add skylights, a knee wall, or make the screen panels from floor to ceiling. 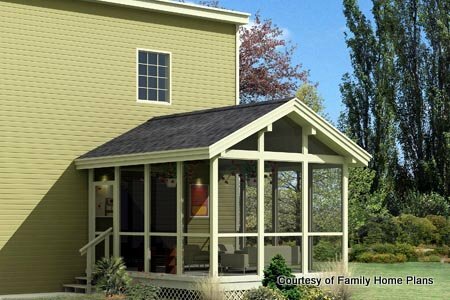 This plan is extremely versatile; you could build it over all or part of your deck or even as a stand alone screened porch. This plan also has much to offer. 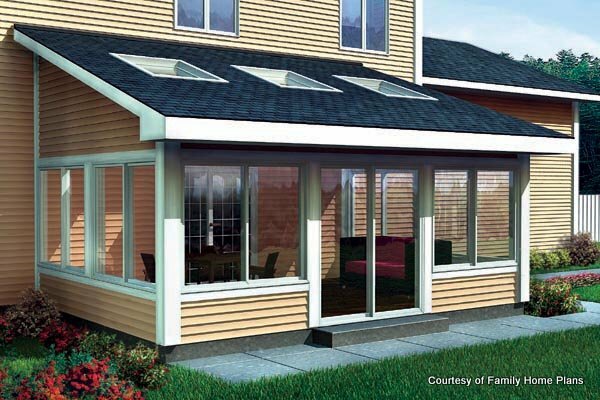 Screened-in porch plans come in a variety of sizes to accommodate existing decks and patios. This particular plan could easily be placed over a patio area, enlarged if needed, and enhanced by moving the screen door to the center of the wall and building a gable roof over it. Here's a plan that is perfect for one story homes. 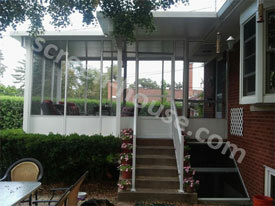 This screen porch could be wider and longer depending on your specific building area. However, you'd have to make sure the roof rise and run could accommodate the width of the porch. Use our handy rise and run guide to assist you in determining your options. What a fun plan! 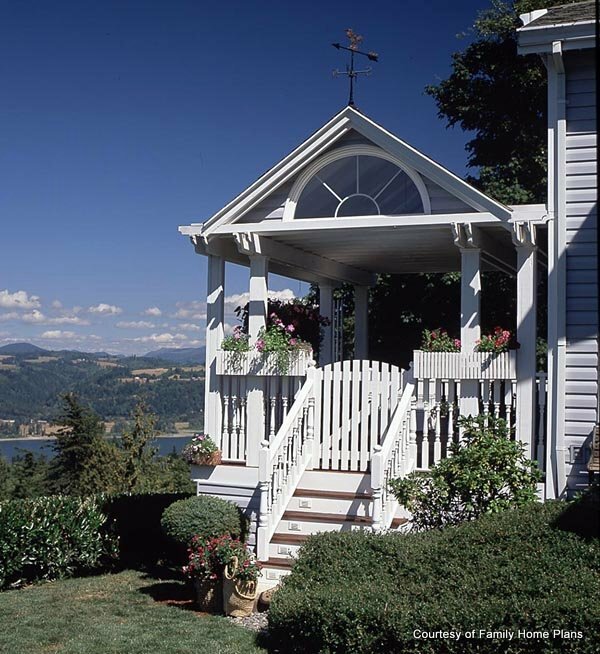 Use this plan to build a gazebo-like porch on the end of your deck. 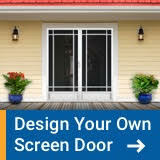 Build or purchase screen panels or screening kits and your screened porch will be the envy of the neighborhood. There are systems available to install screening from column to column; it doesn't get much easier than that. We particularly like screen porch windows which can turn your project into a three season porch if you'd like. This plan allows for maximum view. Add skylights if building in a shaded area for more light, add an outdoor ceiling fan, and build over either a deck foundation or concrete patio. Imagine this with an extended deck or patio area for grilling or sitting around a fire pit. 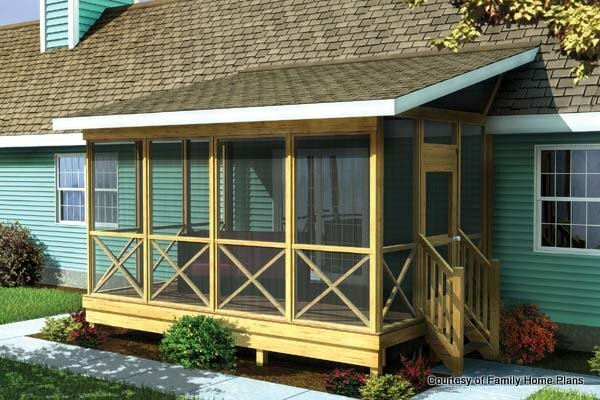 This screen porch plan could easily fit a one or two-story home. 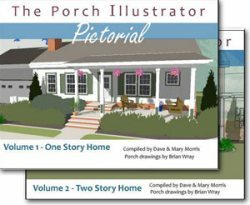 It's designed to be a three-season porch so you'll get the best of both worlds. With the right foundation, heating and cooling, you might be able to convert it as more living space onto your home as well. Like to garden? 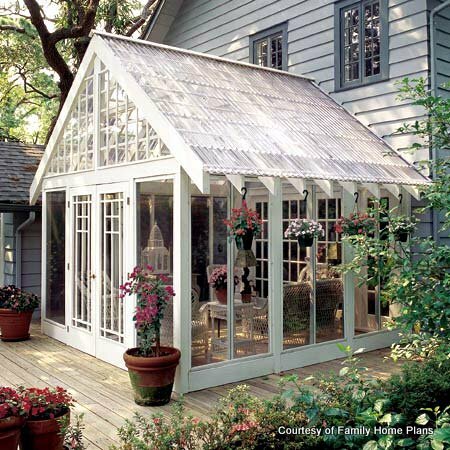 This plan has the look of a conservatory but it is screened. You could easily use vinyl panels to block the wind and rain. Clear-plastic panels make up the roof. 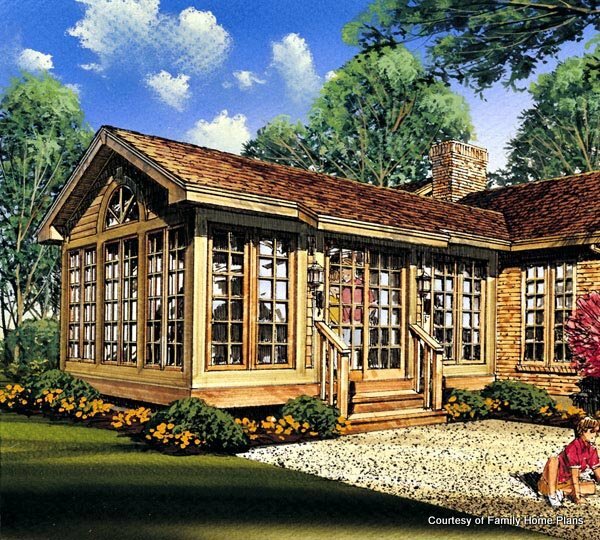 This one is ideal as either a screened porch or three-season porch. For those cool fall evenings use an outdoor heater (according to manufacturer's instructions) to enjoy the evenings longer. Ok, not your usual screen porch plan; but we like it and could do a lot with it. 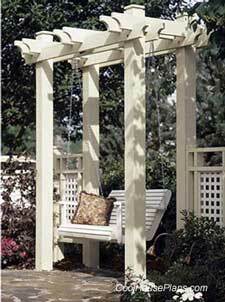 Shown as a stand-alone, it could be adapted for decks or patios too. 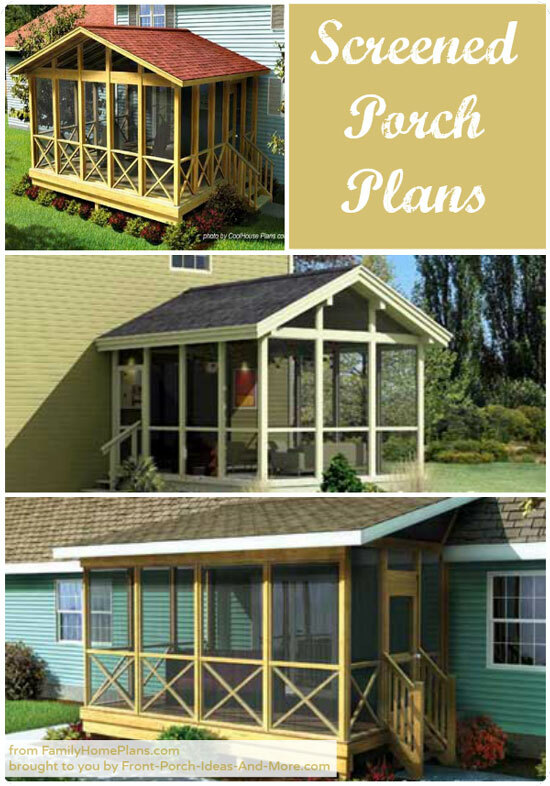 These are just a few of the many screened in porch plans available for you at Family Home Plans . As an affiliate of Family Home Plans we receive a commission on sales; however, the price is no different to you. If you enjoy our content, we appreciate your support. 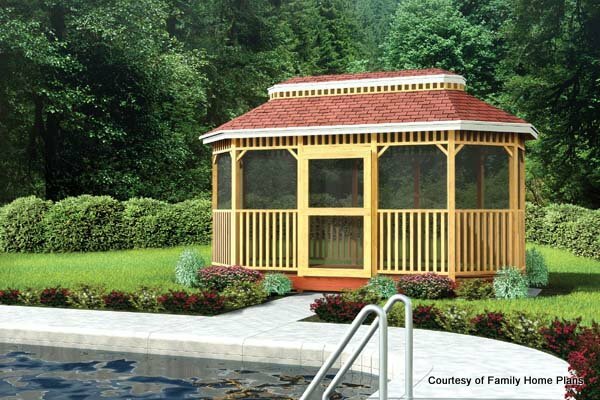 We have not found a better selection of screened in porch plans and service than at the Family Home Plans and wouldn't recommend them for your screened in porch plans if we didn't believe in their product. 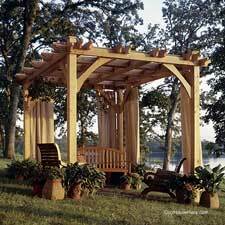 They also have plans for many other outdoor structures like gazebos, arbors, garden benches, planters, and even bird houses to name a few. 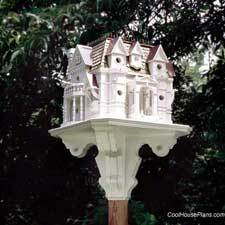 Check out their Project Plans section at Family Home Plans. When selecting a screened in porch plan, look for plans that offer various sizes for your selected design or is closest to the size you need. 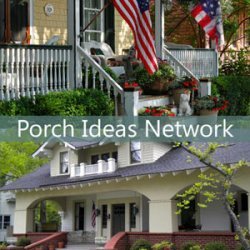 It's usually easy to modify screen porch plans to make it larger, add a knock out section, or use it to add a gazebo on one end of your deck or porch. Envision the exterior. 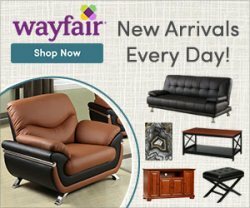 Do you want half or full screens? Do you need a railing or do you prefer a knee wall? Would you like to be able to convert it to a three-season room? Envision a different roof line or combine roof designs. 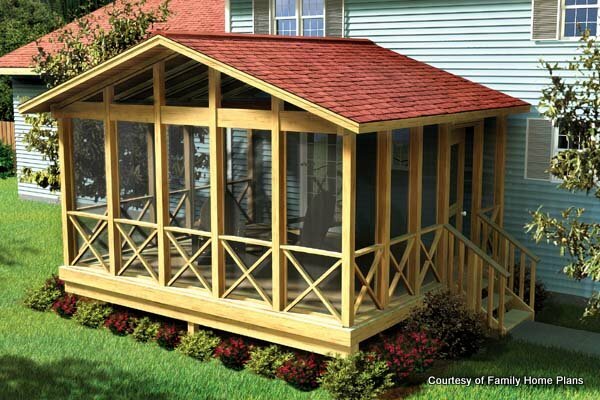 Add a gable roof over the screen door to a shed roof design. 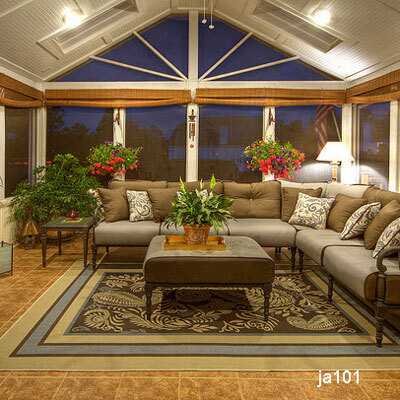 Is your screen porch located in a shady area? Consider adding skylights. Use different supporting columns. Instead of 4x4s make them 4x6s or even 6x6s. Do you want a fireplace with flat screen TV? A plan modification may be necessary. Screened in porch plans can be built as drawn or in some cases, you can add and delete features, lengthen, widen, or shorten the screen porch. A licensed contractor can assist in making your plan just right. If you find the perfect plan all the better but if not, find one that closely fits your requirements and have fun making it your own. IMPORTANT NOTE: Modifications to screened in porch plans must adhere to local building codes so be sure to contact your local codes office prior to building. If in doubt, they can advise about your modifications to ensure you, your family, and property are safe and that your are in compliance. In addition, you must consider your foundation when modifying an existing plan. In some cases the foundation may have to be reinforced or modified to support your screen porch. 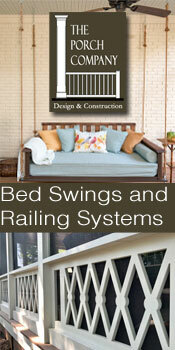 Your local building codes department can assist you. Did you get some nice ideas here? 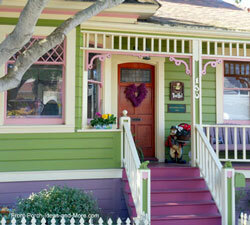 If not the DIYer type but want a screen porch, here's another option you might want to consider. Screen Porch Kits come in a variety of styles, one of which we are confident will be just what you are looking for. From portable units to more permanent structures, screen porch kits are normally more economical and are easy to assemble. 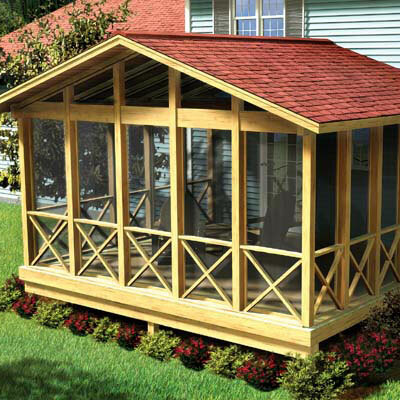 Be sure to see our Screen Porch Kit Section for more information.